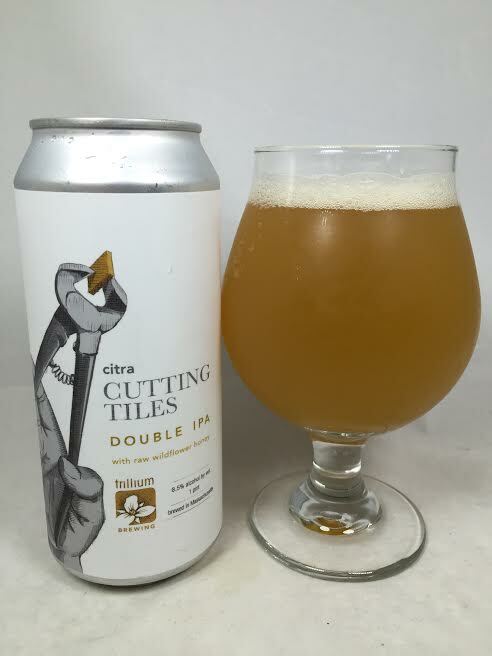 "Cutting Tiles is an exploratory series of Double IPA's featuring a range of aromatic single hop varietals brewed with raw wildflower honey. This new version is dosed with 100% Citra in all kettle, whirlpool and two massive dry hop additions. The local wildflower honey keeps the body light and drinkable but provides a earthy backbone. Floral and zesty up front backed up with a nuanced citrus character on the nose that continues straight through in the flavor profile. Pillowy soft mouthfeel, with a restrained bitterness on the finish"
Like the others, this pours a hazy, glowing orange with maybe one finger of white head. Smells like orange juice and Hi-C. Big orange rind, some bitterness, and floral notes as well. Thinking back to my King Sue review, I would compare this with that since both were all-Citra Double IPAs, but Citra Cutting Tiles doesn't have the Citra explosion as the King did. However, it still has everything you'd expect from an all-Citra DIPA with wave after wave of zesty oranges, pineapple, and peaches. That raw wildflower honey was mostly absent from the nose, but a noticeably sweet kick is accounted for here on the taste. Combined with the Citra, it makes for a sherbet-esque, dessert experience. As with the aroma, some mild bitterness is here with a slight dankness. The finish and aftertaste are a little dry and are soaked with bitter hop juice. Mouthfeel this time around for this series has noticeable carbonation and does not carry that flat sensation as the other Cutting Tiles variants. I also do see with this series that the body doesn't carry that trademark Trillium creamy or pillow texture, but it is still full enough to get the job done. No trace of 8.5% anywhere and it feels like a single IPA rather than a DIPA. It's no surprise that another variant in the Trillium Cutting Tiles series is a big winner. You can't go wrong with an all-Citra Double IPA and this one is delicious, easy-to-drink, and another notch in Trillium's belt. What will be next in the series? I'm not sure (C'mon El Dorado! ), but since everything else has been a winner, then we all know it will be great.